News Alert: Valentine’s Day is just around the corner. Do you have plans? After many years of marriage and motherhood, Valentine’s Day doesn’t have the same thrill as it did years ago. But, it’s still a day to show those around you that you love and care for them. And my favorite way to do that is to bake something special. 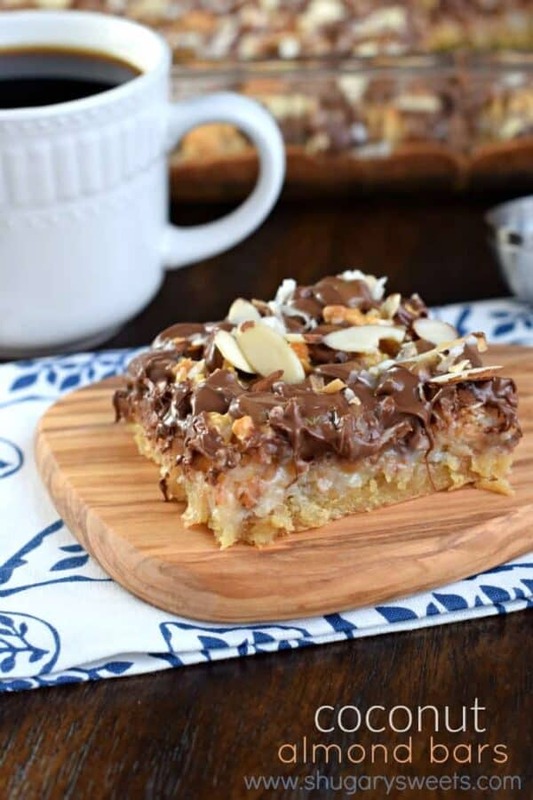 Today’s Coconut Almond Bars might just be the perfect Valentine’s dessert idea for you and your loved ones! Years ago I decided that the days between New Years and Valentine’s Day should be filled with coconut. After all, the fluffy white treat reminds me of snow! However, I prefer my coconut toasted. I love the sweet flavor that comes through after cooking. It’s the same thing that happens when you roast your vegetables. Okay. Maybe it’s not THE SAME THING, but you get my point. Right? 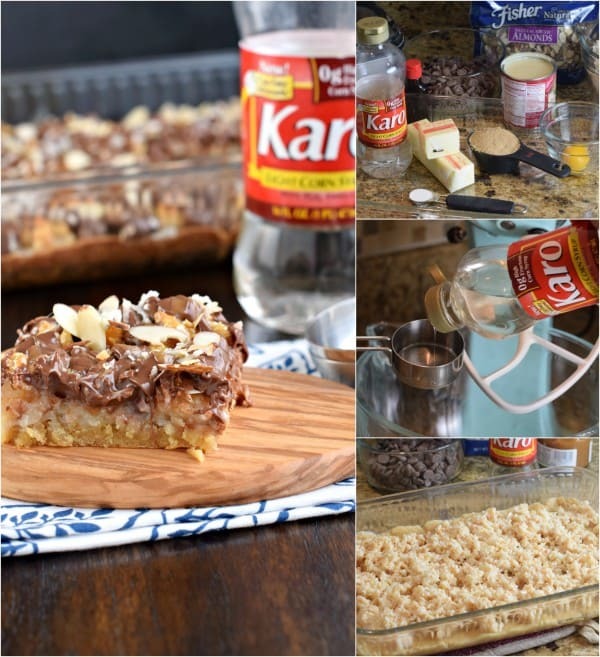 Toasting the coconut first gives these bars a delicious sweet crunch! And the corn syrup gives the crust a sweet, chewy texture. So let’s all agree: crunchy, chewy bars are the best. Oh wait, and these have chocolate AND caramel too. What’s NOT to love? 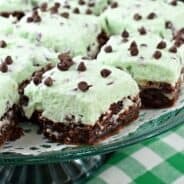 I used THIS recipe as a starting point for today’s treat! Adding in some almond extract to the crust and the filling gave the bars depth in flavor. Use baking spray to coat your baking dish. Or line it with parchment paper. The sticky filling might adhere to your pan, otherwise. While the crust is baking (for about 5-6 minutes) whip up the filling. It’s going to be very thick, so be careful when adding it on top of your crust. I used a scoop to drop tablespoons of filling evenly over my bottom layer. When the bars are done baking, immediately sprinkle on your chocolate chips. I also added the caramel and sliced almonds at this time too. I didn’t spread my chocolate like the original recipe stated, and it turned out just fine this way. 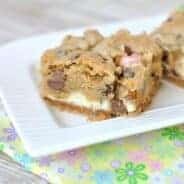 They remind me of those ooey, gooey Magic Bars! Once cooled, store these in the refrigerator. You’ll love the chilled flavor and it keeps them from getting too soft! ENJOY. Preheat oven to 350°F. On a large baking sheet, spread out coconut into a single layer. Bake for 10-15 minutes, stirring every 5 minutes. Coconut should be lightly browned when done. Remove and cool. For the crust, beat together butter, corn syrup, brown sugar, almond extract, and egg yolk until smooth. Add in flour, baking powder, and salt and beat until fully combined. Pat dough into the bottom of a greased 13x9-inch baking dish. Bake for 5- 6 minutes (it will not be fully cooked) in a 350°F oven. While crust is baking, combined the toasted coconut, almond extract, sweetened condensed milk in a bowl. Drop by tablespoon onto the partially baked crust. Return to oven and bake an additional 20-22 minutes, until edges of crust are lightly browned. Remove from oven and sprinkle with milk chocolate chips immediately. Drizzle caramel sauce over the top and add sliced almonds. Allow to cool completely. Once cooled, cover and refrigerate at least 30 minutes before slicing and serving. I prefer to store this in the refrigerator to keep the bars from getting too soft. ENJOY. I agree, the time between New Year’s and Valentine’s Day should be filled with coconut….and I wish my roasted vegetables tasted just like coconut. 🙂 These bars are totally my jam, I can’t WAIT to make them. So yummy looking! These bars look like Almond Joys on steroids! I love how soft and gooey that middle is and anything with coconut is a favorite of mine! These are all my favorite flavors. I’m seriously drooling. Must try! I am in love!! This looks so good. 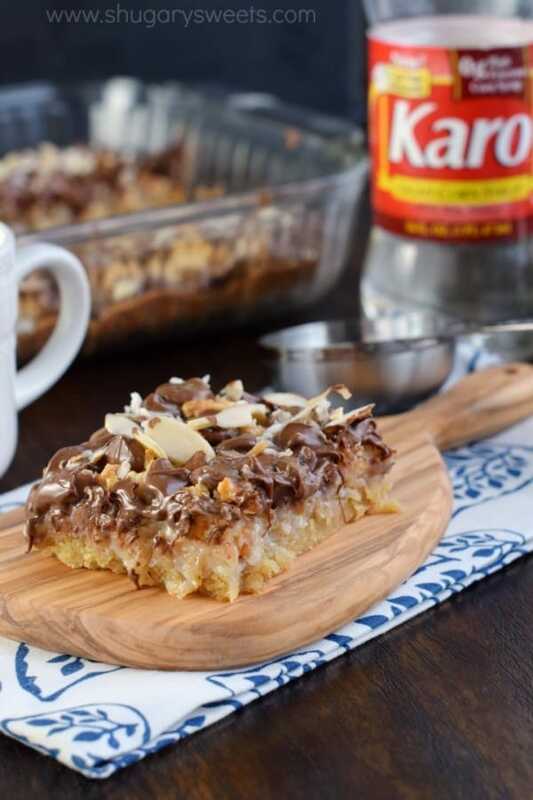 Coconut, almonds, chocolate, and Karo. My favorites!! If there’s almond extract in the crust, case closed. I want these so badly! And that filling looks amazing! As for Valentine’s Day, there better be plans. My husband has been taught over the years to get his act together. 🙂 In return, I bake for him. 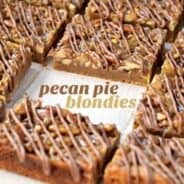 Baking is love! 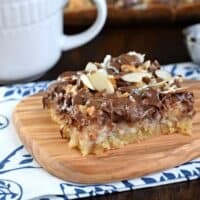 Can’t go wrong combining chocolate, coconut, and almonds! These bars look incredible! What kind of caramel sauce are you using..? 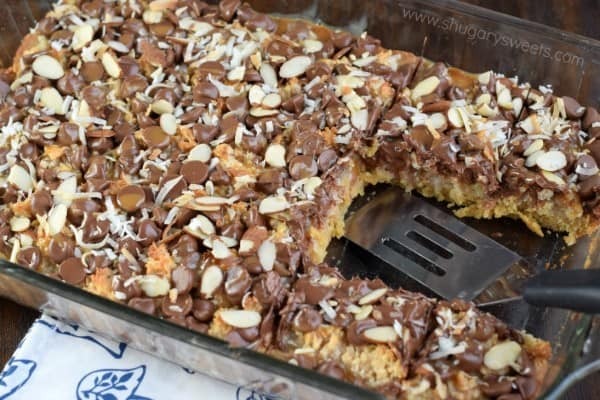 I don’t know anything else you could add to these bars to make them more scrumptious. They look totally addictive and definitely something that wouldn’t last long in my house.